Anytime Natalia and Jourdanton are in the same softball district, you can assure yourself of a great game and a playoff type atmosphere. Last Friday night was no different, as a state of the art softball complex in Atascosa County was split down the middle. Half of the stands were packed full of fans with blue and white on, as the other half had a sea of red. Just like any other rivalry in Texas, you can throw out records and predictions when these two meet and last Friday this is what happened. 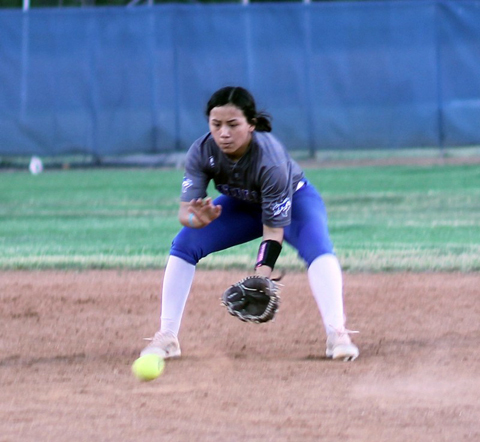 The favorite, Natalia, surrendered twelve hits and a season high nine defensive errors resulting in a tough 10-9 loss in 8-innings allowing the Squaws, to take over 1st place in 30-3A. The toughest stat at the end of the night was the # of runs J-Town “didn’t” earn. Jourdanton jumped on Natalia early, as they used a single and a double to set up a huge momentum boosting three run-homer by Harlan to give the Squaws a lead they would never allow to be taken over. The girls in blue produced their first run of the game, in the top of the 2nd inning as Abi Woodson got things going with a single. She was able to score thanks to singles by Gabi Munoz and Bryanna Perez. Jourdanton added two runs in the bottom of the 2nd, as they used three singles and a crucial error by Natalia to take a 5-1 lead on the girls in blue. Natalia continued to claw their way to stay close, as Biviana Figueroa belted out home-run # 7 of the season putting the game at 5-2 in favor of the Squaws. Jourdanton continued to apply pressure to the Natalia defense which hasn’t been consistent this season. J-Town used two more crucial errors and an single to score two more runs allowing them to hold a commanding 7-2 lead on Natalia. The Lady Stangs chipped away again in the top of the 4th, as they used a Munoz single, one stolen base, a Gabby Contreras error put into play and a passed ball to score their 3rd run of the game. Natalia finally held the Squaws scoreless in the bottom of the 4th. They used an F-8, a fielder’s choice and an F-3 to get out of the inning. Never say die, the girls in blue continued to fight as they came up with two additional runs in the top of the 5th. They started off the inning with a base on balls by KK Lara which was followed by a base on balls by Bivi Figueroa. Natalia then used a single by Woodson and a fly-out to score in Lara and Woodson allowing Natalia to get within 7-5 of the Squaws. Unfortunately, the Squaws put more pressure on the Natalia D in the bottom of the 5th and Natalia folded again. Three errors and one single later, the Squaws were able to score two additional runs allowing them to hold a 9-5 lead versus the Lady Stangs. This is when the Lady Stangs stepped up even more offensively with the game on the line. Natalia used an error put into play by Contreras, a walk by M. Figueroa, a double by Alvarado, a single by Lara, a double by Vera and an error put into play by Woodson to produce a huge four run inning tying the Squaws 9-9! Natalia’s defense rose up in the bottom of the 6th, as they forced J-Town to strand a lead-off single as Woodson accounted for a pair of Ks and a ground out to 1st ended the Squaws hopes of getting a run. In the top of the 7th, Natalia started things off with a single by Perez. Unfortunately she would not score, as Natalia was caught stealing and had two strike-outs to end any hopes of scoring the game winning run. Jourdanton got their lead off runner on thanks to a hit by a pitch. Natalia then used a fly-out to right for out one of the inning. Jourdanton was then able to single hop the middle to put two on for the Squaws. Natalia came through defensively, as they had a fly out to 12st and a 1-3 defensive play to get out of the inning. Natalia had their chances down the stretch once again in the 8th. The Lady Stangs stranded bases loaded in the inning, which took the wind out of their sails. Jourdanton put Natalia away in the bottom of the 8th thanks to a single and two straight errors to pick up a 10-9 victory over the Lady Stangs. Woodson gave up the second most hits of the season with 14, as she walked 0, struck out six and allowed ten runs. The tough fact of the game, was only three of the ten were earned. At bat: Vera 2-4-1RBI-2runs scored, Alvarado 1-5-2RBIs-1run scored, Munoz 1-1, Contreras 0-3-1run scored, M. Figueroa 0-1-1RBI-1run scored, Lara 2-2-1RBI-1run scored, B. Perez 2-5-1RBI, Woodson 2-4-1run scored, D.Perez 0-1, Santoya 1-3-1RBI-1run scored and B. Figueroa 1-4-1RBi-1run scored. Defensive Put-Outs: B. Figueroa 6, Contreras 6, M. Figueroa 3, Vera 2, B. Perez 1, Woodson 1. Assists: Alvarado 3, M. Figueroa 2, Woodson 2.